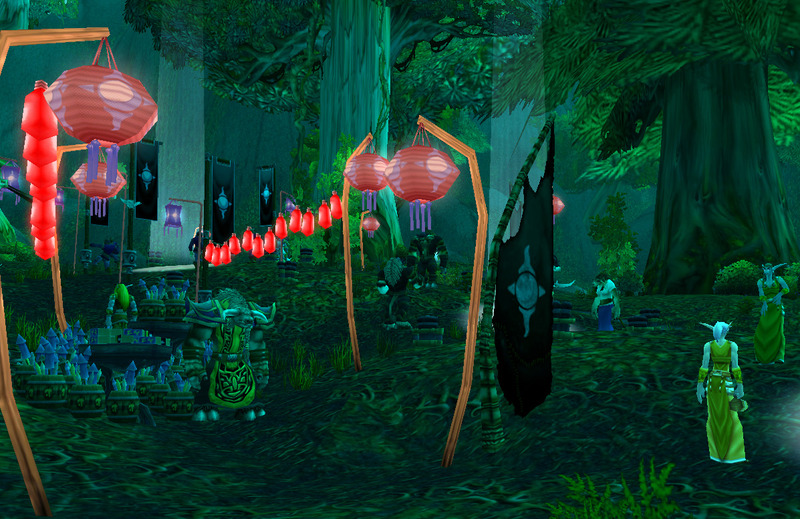 Every year the druids of Moonglade hold a celebration of their city's great triumph over an ancient evil. During the Lunar Festival, citizens of Azeroth have the opportunity to honor their elders by celebrating their sage wisdom, sharing in magnificent feasts, and of course... shooting fireworks! A Coin of Ancestry Receive a Coin of Ancestry. 5 Coins of Ancestry Receive 5 Coins of Ancestry. 10 Coins of Ancestry Receive 10 Coins of Ancestry. 25 Coins of Ancestry Receive 25 Coins of Ancestry. 50 Coins of Ancestry Receive 50 Coins of Ancestry. Lunar Festival Finery Purchase a festive pant suit or festive dress with Coins of Ancestry. Elders of the Dungeons Honor the Elders which are located inside the dungeons. Elders of Kalimdor Honor the Elders which are located in Kalimdor. 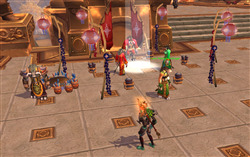 To Honor One's Elders Complete the Lunar Festival achievements listed below. Elders of the Horde Honor the Elders which are located in the Horde capital cities. Elders of the Alliance Honor the Elders which are located in the Alliance capital cities. Elune's Blessing Complete the Elune's Blessing quest by defeating Omen. The Rocket's Red Glare Shoot off 10 Red Rocket Clusters in 25 seconds or less. Elders of Northrend Honor the Elders which are located in Northrend. Frenzied Firecracker Shoot off 10 Festival Firecrackers in 30 seconds or less. Elders of Cataclysm Honor the Elders which are located in zones opened by the cataclysm. -----You will need to speak with Zidormi to switch phases to pre-invasion Blasted Lands. *IMPORTANT: Horde, you do not need to take the boat from Stormwind if you have old-world flying. Just find the point of water (it's "near" Lor'danel) that sticks out the most, point your character in the direction of Rut'theran Village and fly a straight line. 150% flying speed is enough to make it. Also, if you have old world flying, just fly up and over the tree stump. DON'T use the teleporter. As a normal-dungeons 85 DK, I was gibbed. (The guard NPCs are now level 90 instead of 85, be careful.) Non-flyers – prepare to corpse run. Includes level ranges from Wowhead, blue post,and additional info from browsing Wowhead comments. Level range = recommended low-high (absolute minimum for entering instance). Elder Starsong - Sunken Temple - 50-60 (45) | Note: Sunken Temple is the instance. Appears as The Temple of Atal'Hakkar on zone map. Elder Nurgen - Azjol-Nerub - 72-74 (67) | Note: Must kill Krik'thir the Gatewatcher in order to progress to elder. Elder Kilias - Drak'Tharon Keep - 74-76 (69) | Note: Classes/races w/o some form of stealth must kill Trollgore to progress to elder. Elder Chogan'gada - Utgarde Pinnacle - 79-80 (75) | Note: Must kill Skadi the Ruthless in order to progress to elder. There are 2 vanity pets available from Lunar Festival, one from Alliance side and one from Horde side. They are sold from vendor in Moonglade for 50 coins of ancestry each. Both pets can be sold on the Auction house and can go pretty high through the year. For anyone looking for an in-game guide or map, I made a HandyNotes_LunarFestival addon which will add the locations of each Elder to the world map. It needs HandyNotes as well to work. Candy Buckets can also be used for the same purpose if you're looking for an alternate to Handy_Notes. 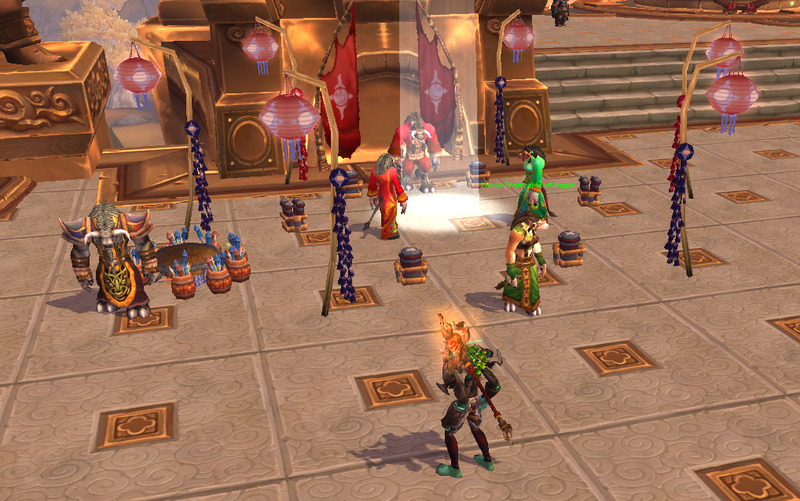 The Lunar Festival is WoW's version of Chinese New Year. Participation mostly includes traveling the world to visit all the Elder NPCs to collect Coins of Ancestry. These can be used to purchase various items like costumes, vanity pets, recipes, and fireworks. 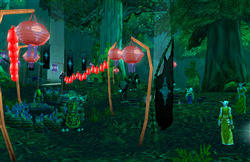 The main festival takes place in Moonglade, which can be reached by requesting a Lunar Festival Invitation from various NPCs in capital cities and using the item while standing in the moonbeam near them. There are a number of achievements associated with this holiday. The Lunar Festival meta achievement earns player the title Elder <Name> and is needed towards completion of the WoW holiday meta What a Long, Strange Trip It's Been to earn your purple proto-drake. There are three new toys for 2017's Lunar Festival. It requires three players to "assemble" the whole costume, which makes it/them unique (in comparison to other toys). It comes to 60 coins total if you want to collect all of them. See my older comment on this page for locations of elders, or visit Icy Vein's Lunar Festival 2017 Guide for that plus other details. Purchasing all seven requires a total of 150 Coin of Ancestry. There are only 84 elders from which you can obtain a coin, so it's not possible to get all the new toys using only one character. Hope you have a high-level alt handy! NOTE: They can only be transmogrified during the holiday world event.